Although this recipe post is tagged as "Italian," there is some debate about where penne alla vodka really originated. Some claim it's actually an Italian-American invention, while others claim it originated in Italy. According to Paula A. Franzese, her father, Luigi, supposedly first created this dish (originally called "penne alla Russia") back in the 1970's while he was a chef working at Orsini, an NYC restaurant. Other food historians contest this and instead credit Chef James Doty as its originator. Cookbook author Pasquale Bruno, Jr., claims that it was invented at a restaurant in Bologna, Italy called Dante, while The Williams Sonoma Essentials of Italian cookbook states that it was invented in the 1980s by a Roman chef for a vodka company that wanted to popularize its product in Italy. Anyhow, hope you enjoy this tasty & much healthier version. :) Alla tua salute! 3 Tbsp. cured black olives (i.e., Kalamata, Greek, etc.). Directions: In a large nonstick sauté pan, sauté the garlic & onions in olive oil on low heat until soft (& onions have become translucent), about 5 minutes. Add the vodka to deglaze the pan, turn up heat to medium-high, and let it reduce by half. Turn down the heat to medium-low & then stir in the tomatoes, tomato paste, red chili pepper flakes, salt, & pepper. Simmer uncovered for about 20 minutes, stirring occasionally, then add the creamer & milk and simmer another 10 minutes. Reduce sauce until adequately thickened. While sauce is cooking, bring a large pot of (4 c.) lightly salted water to a boil. Add a drop of olive oil (to prevent pasta from sticking together & to the sides of the pot), & add penne, cooking it until it's become al dente, typically about 9-11 minutes for dried pasta. (Follow package instructions.) Drain, place in a colander & run under a little cold water, & then drain it once more. Return pasta to the pot it was cooked in. Remove the sauce from the heat & pour over the pasta. Add the basil and the cheese, and stir well until the pasta is completely coated with sauce. Transfer to two bowls/plates. 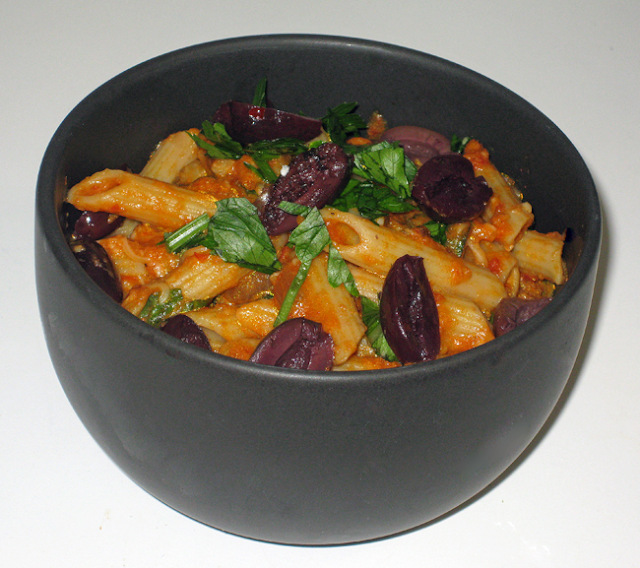 Garnish each portion with equal portions of olives & fresh chopped parsley (1 1/2 Tbsp. and 1/2 Tbsp. each, respectively). Serve immediately. Chef's Notes: This dish also tastes really good with (1/2 c.) fresh mushrooms &/or (1 Tbsp.) capers.